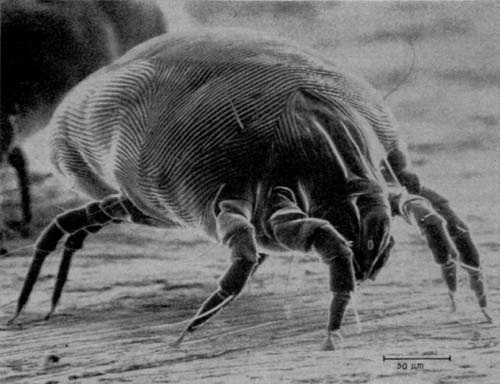 Dust mites are microscopic creatures and are mostly found in the fabrics of carpets, bedding and furniture although they are so tiny that they can become airborne. Dust mites eat tiny particles of organic matter - especially human skin cell dust. They also like to eat remains of other insects such as silverfish, fleas and roaches. They are so small that they cannot be seen without a powerful magnifying glass or microscope. This might be a good thing, because when looked at under a microscope they are pretty gross (see pic below). Dust mites are eight-legged and are related to spiders. And the shocking fact is that there may easily be tens or hundreds of thousands of them in your home! Laying eggs and excreting! The excretions of dust mites create.... you've guessed it... more small dust particles! These excreta can be harmful and are known to be major triggers of asthma and allergic reactions to dust. Dust mites do not bite or sting, but it is claimed that 10% of the population is allergic to their droppings - which are so small that they are easily stirred up and breathed in! What can be done to get rid of dust mites? Well, unless you want to live in a cleanroom wearing a spacesuit (which actually sounds quite appealing in some ways to us over here at off-grid.info/air-quality HQ! ), you pretty much have to deal with the fact that there are going to be some dust mites in your life. Like I said earlier, it might be good that we can't see them. But we can reduce their numbers. The greatest factor in dust mite proliferation is humidity. Dust mites like over 50% humidity, and under 40% is optimal in controlling their numbers. Dust mites' prime habitat is bedding. Pillows and mattresses are most prone as these are not cleaned often. Allergy stores may carry covers for pillows and mattresses that are impermeable to the mites. Washing bedclothes in hot water (130 deg F) is commonly recommended although this is hot enough to scald and hotter than the water coming out of most hot taps! Fabrics that cannot be washed on a hot setting can apparently be put in the deep freeze for 24-48 hours to kill dust mites. Another thing that may help finish off those pesky mites is to put pillows and fabrics through a tumble drier. Unfortunately, even after much Google searching we could not find reliable figures for what temperatures are reached inside a typical consumer tumble drier - but they seem to be in the range of 125 deg F (delicate setting) to 175 deg F - which combined with the low level of humidity, would appear to be a good idea for getting rid of mites - although we have found no actual scientific study on this subject. Dust mites love your carpet. If you were serious you get rid of carpets in your home and replace fabric-covered furniture with leather or vinyl upholstery (but it would probably be easier to get a good HEPA air purifier). Replace feather and down pillows with ones that are made of synthetic fibers / machine washable. Having carpets steam-cleaned is a good way to get rid of dust mites. Other effective measures include:vacuuming regularly, use a HEPA air purifier, and wash bedclothes and other fabrics regularly. Because of their air-cleaning effect, HEPA air filters might just help prevent you from breathing in these critters and their feces! Microscope image of a lovely dust mite chilling out in between dead skin cell snacks. As dust mites go, we think this one's a "ten". If you look closely you can see the size marker of 50 microns in the lower right. A micron is one thousandth of a millimeter.